Nearly $700 million in federal aid for victims of Hurricanes Katrina and Rita is unaccounted for, according to a new report from a government watchdog. 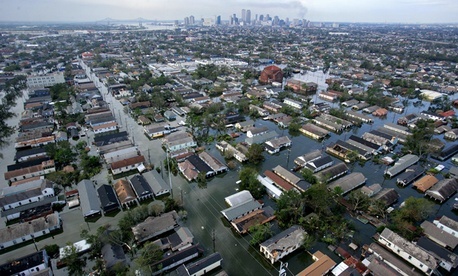 More than 24,000 homeowners in Louisiana who received millions in disaster recovery grants after the 2005 storms either did not comply with the terms of the aid, were nonresponsive, or did not provide sufficient documentation of how they spent the money as of August 2012, the Housing and Urban Development Department’s inspector general found. “Therefore the state did not have conclusive evidence that the $698.5 million in Community Development Block Grant disaster recovery funds had been used to elevate homes,” the March 2013 report stated. The IG was following up on its March 2010 review of Louisiana’s elevation incentive program, part of the state’s $9 billion Road Home Program to help people rebuild after Katrina and Rita. The $940.5 million elevation incentive program offered eligible homeowners grants of up to $30,000; in return homeowners agreed to comply with elevation requirements and with building and manufactured housing codes in their area within three years, as well as maintain homeowner and flood insurance. Louisiana, which developed a program to monitor homeowners who received federal funds and identify those who haven’t met the program requirements, is working with HUD to ensure greater compliance and responsiveness, said Patrick Forbes, executive director of the state’s Office of Community Development. “Rather than immediately embarking on the process of recapturing funds from all applicants who do not currently have all required compliance documentation in their files, [the state office] believes it is prudent to bring more applicants into compliance through ongoing file completion, elevation activities and working with HUD to approve and implement action plan amendments, reserving grant recovery for those applicants who cannot achieve compliance through these and or other means,” Forbes wrote in response to the IG report. The IG findings have prompted concern over how the government plans to manage the nearly $16 million in disaster recovery aid for the Northeast after October 2012’s devastating megastorm Sandy. Sen. Tom Coburn, R-Okla., sent an April 1 letter to HUD Secretary Shaun Donovan asking how the department will ensure that money is properly spent and accounted for. “HUD must be diligent in its oversight of elevation funds as they are granted, and not years later,” Coburn wrote. President Obama designated Donovan to oversee the federal response to Sandy. Disasters create different categories of need and the government’s way of prioritizing those needs can perplex victims as well as federal and state officials. HUD and the Federal Emergency Management Agency, for instance, are only two of several agencies that administer disaster assistance, and figuring out who is eligible for what kind of aid often is as confusing and overwhelming as the disaster itself.